Escape the urban bustle at Cottesloe Beach and Perth Zoo. 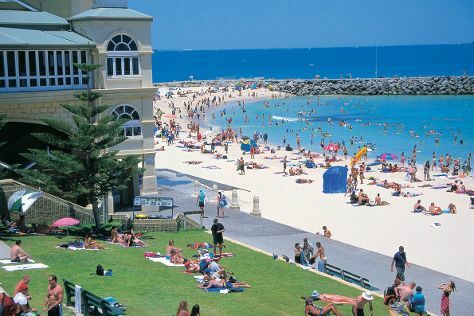 Your itinerary includes some good beach time at Scarborough Beach and Sorrento Beach. You'll find plenty of places to visit near Perth: Dolphin & Whale Watching (in Mandurah) and Fremantle Prison (in Fremantle). There's still lots to do: explore the activities along Swan River, walk around Kings Park & Botanic Garden, steep yourself in history at The Perth Mint, and take in the architecture and atmosphere at St Brigid's Church. To find more things to do, ratings, maps, and tourist information, use the Perth tour itinerary planning site . In February, daily temperatures in Perth can reach 38°C, while at night they dip to 20°C. Cap off your sightseeing on the 20th (Wed) early enough to travel back home.